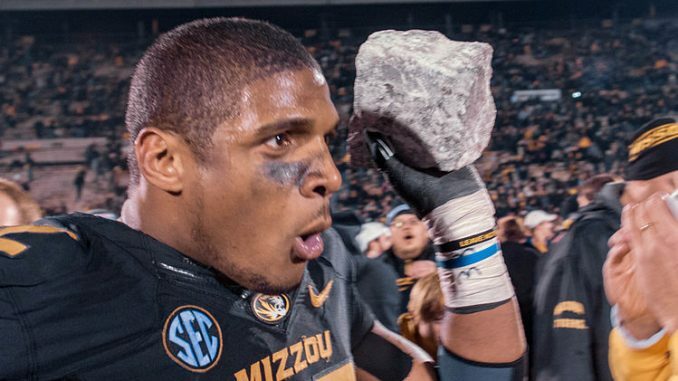 This past Sunday former University of Missouri defensive end Michael Sam announced that he is gay and, looking forward to the 2014 NFL draft, he could become the first openly gay player in American professional football history. This past year Sam was named a First Team All-American and was the co-Defensive Player of the Year in the South Eastern Conference, which is widely regarded as the best conference in college football. Sam, who led the SEC in sacks (11.5) and tackles for loss (19), is currently projected as a middle round pick in the upcoming draft. Although Sam is not yet a pro, his announcement displays courage and determination and is a monumental step for the lesbian, gay, bi/transgender and queer (LGBTQ) community. There are obviously going to be people, both in the league and outside of it, who will challenge Sam’s decision to come out, despite the bravery he has exhibited. Similar to the way that Jackie Robinson experienced discrimination as the first black Major League Baseball player, Sam will undoubtedly be attacked because he is different. Sam has received widespread support from a number of athletes and pundits all across America. Former New Orleans Saints linebacker Jonathan Vilma recently spoke on Mike & Mike in the Morning, discussing how he believes the NFL will receive its first openly gay player. “There are many different dynamics in the locker room that no one is prepared for,” Vilma said. “And no one knows about because this is the first time you have an openly gay person coming out, in Michael Sam, and, whichever locker room he goes to, that will be the very first time, that I know of, in NFL history where you have an openly gay person coming into a locker room and playing football. Although Sam has yet to play a single down in the NFL – or even be drafted – his resolve has paved the way for queer athletes across America. Artist in residence explores human trafficking in U.S.